Why didn't the Secret Service take a shoe for Bush? The shoe incident in Baghdad may look like the result of a security lapse, but actually, the people protecting public officials usually don't expect journalists to attack them. 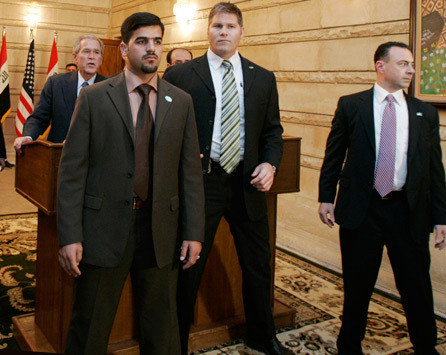 Bodyguards protect U.S. President George W. Bush after a shoe was thrown at him during a joint news conference in Baghdad December 14, 2008. An Iraqi reporter called visiting U.S. President Bush a "dog" in Arabic on Sunday and threw his shoes at him during a news conference in Baghdad. Take a break, briefly, from replaying the clips of Muntader al-Zaidi's footwear attack on President Bush. Stop and think about what it shows for a minute. Besides the simple fact that the guy hurled his shoes at the president of the United States, does anything else about the video stand out as a surprise? Yes, that's right -- at the critical moment, there was not a single Secret Service agent standing close enough to take a shoe for the president. The shoe attack may make for a simultaneously amusing and sad commentary on the final days of the Bush administration, but that's in part because it didn't end with anyone solemnly intoning the truly horrifying words "President Cheney." Had al-Zaidi been armed with anything more dangerous than a loafer, though, everyone would be asking what went wrong with the elaborate system that's supposed to protect the president -- especially in Baghdad, which may be safer than it was after the U.S. invaded, but isn't exactly Mayberry. But even though Bush escaped unharmed, why isn't anyone asking that now? Mostly because in this particular case, the system basically worked. There wasn't an agent positioned to block the shoe -- because Bush was giving a press conference in a secure room with Iraqi President Nouri al-Maliki. It may seem odd considering how much the Bush administration likes to claim the liberal media is out to get them, but the president isn't as closely guarded when he's alone with the press as he is when he's out in public. The same goes for meetings with aides, lawmakers, constituents or anyone else who's already had to pass through security screening just to get into Bush's vicinity. When presidents (or presidential candidates, or the president-elect) are shaking hands in a crowd at rally, they've usually got Secret Service agents pressed on all sides of them, close enough to get in the way of any trouble. But once people have gotten past the various gatekeepers who are in charge of access to the president, the Secret Service usually figures they're safe enough to stand a few feet away during press conferences and meetings. Unless the security standards are looser in Iraq than they are in Washington (which seems hard to believe), by the time al-Zaidi was close enough to Bush throw anything at him, he'd already gone through a metal detector and had his bag and the contents of his pockets inspected. Since he didn't have anything that seemed too dangerous, the Service probably wrote him off as relatively harmless. Instead, they got a quick lesson in what a hostile press corps really is. And al-Zaidi, as the video shows, got dragged out of the room. Even if al-Zaidi's aim was better, Bush would probably have been more or less okay; if a rogue pretzel can't kill him, a shoe isn't going to. Of course, given the way the Bush administration has reacted to threats in the past, what this probably all means is that future meetings with U.S. presidents will require removing your shoes and leaving them in the next room. (After all, you still can't go through airport security fully shod, years after the attempted shoe bomber's capture.) For now, though, he should be safe: Upon his return to the White House tonight, Bush is scheduled to speak at a Hanukah reception. Fortunately for the Secret Service, yarmulkes don't fly quite as far as shoes.